Keckley manufactures low pressure flanged and fabricated KGV knife gate valves that have a large port. 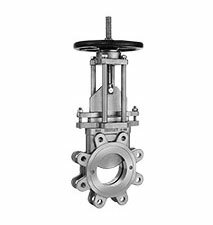 Our knife gate valves provides a low pressure drop across the valve and is better suited to handle slurries, solids, and other fluid/solid mixtures than average plug valves, butterfly valves, or ball valves. Keckley manufactures knife gate valves for applications such as pulp and paper, chemical, petrochemical, power, mining, waste water and more.